The image at right shows the problem that Lean, as well as its predecessor systems of progressive management, has been unable to overcome and may never overcome: The inability to displace de jure — except in rare cases, and for only a limited time. Sooner or later, de jure wins. The image shows the existence of two different problem-solving mindsets within one company or organization: de jure and de facto. The former mindset is used for solving business (i.e. money) problems (running the business) while the latter mindset is used for solving technical problems (running the process, KPIs). 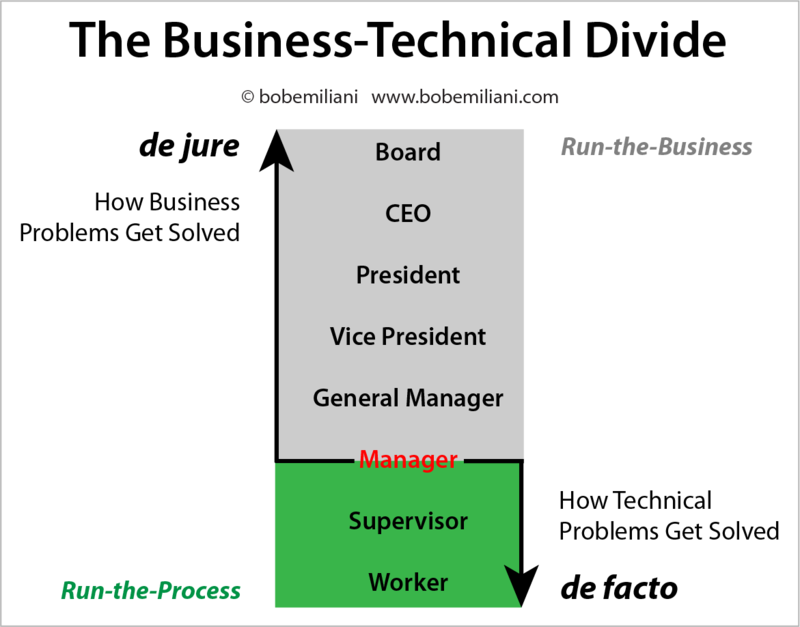 De jure is characteristic of Classical management while de facto is characteristic of Lean management. What Lean people see as defects in Classical management, executives see as time-tested features of a exquisitely-developed system for making money, one that is both right and good — and scarcely in need of improvement, such as closing the run-the-business and run-the-process divide. De jure is tightly coupled to the past, while de facto is tightly coupled to the present. If something in business is difficult to change, that is because it is held in place by nearly invisible chains moored to the past. Leaders do what they can understand, and Classical management, deeply ingrained in their thinking from one leader to the next, is what they understand. Leaders do not do what they do not understand, and so Lean thinking and Lean practice is invariably delegated to the lower levels of the organization. The mid-manager level is the inflection point. Middle-managers must, at some point, choose between de jure and de facto. 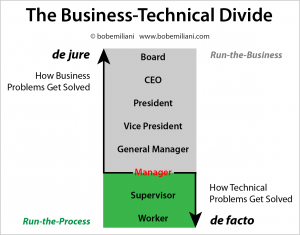 To learn more about de jure and how it affects leaders’ thinking and management practice, its relation to de facto, and what you can do about it, please read my book, Triumph of Classical Management Over Lean Management. To learn how to close the de jure (run-the-business)-de facto (run-the-process) divide, please read Speed Leadership: A New Way to Lead for Rapidly Changing Times. God bless you Bob: you are right in all of your assessments and countermeasures of the subject and the object of process analysis and work simplification and management-good and bad. Fake lean is, was and ever shall be: fascinating to me is your perception, interpretation and action of the truth, and that you haven’t wearied. Speak the truth, be it in season or out of season, just keep clarifying that the men and women whom own the processes are capable of improving them and want only to do a good job. Our processes may be improved but our leaders, all, eventually, get to the moment of truth, where they have to surrender their ego, and there lean ends, almost invariably. Thank you Tahashi-san. I will keep at it. More good stuff to come.